Brad and Brittney’s Casa Romantica Wedding was held at the most exquisite bluff-top estate in San Clemente. Brittney’s twist on the modern boho wedding was beautifully intimate and romantic. 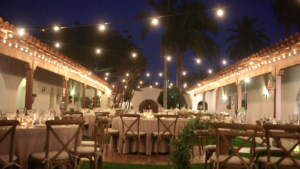 With its spectacular views of the beautiful Pacific and its stunning architecture, Casa Romantica was the perfect venue for Brad and Brittney to exchange vows and bring all of these elements together. Brittney and Brad’s love story definitely has a sense of serendipity to it. In 2004, Brittney was moving to a new place and she needed help moving some furniture. Through a series of events, Brittney’s friend Mike asked one of his co workers, Brad, if he would help this young sweet girl move. Brad agreed, they moved the furniture in and after Brittney bought him pizza to say thanks, they went on their separate ways. No flirting nor asking on any dates. Six years later, Britt and Brad met again at a friends house for game night. They actually didn’t remember each other from their previous meet, but regardless, they hit it off. Brittney & Brad had a lot in common and Brittney developed a new found love for fishing after a few years of dating. The rest is history. In November of 2016, they married at Casa Romantica. Surrounded by family and friends at a gorgeous venue with in incredible view, Brittney and Brad’s wedding was simply gorgeous. We were extremely honored to create their Casa Romantica wedding video film for them while working along side and amazing vendor team. Cheers to Brittney and Brad!